This will be an active way to present one of our nursery rhymes we have been learning in greeting time and to further support understanding of it's meaning. We will go over the rhyme together and the words that may be new, "Muffet sounds like Tuffet. What is a tuffet?". Then we will act out the rhyme while repeating it together. Each student will have a turn to sit on the cushion 'tuffet' and to eat imaginary 'curds and whey' with their spoon and bowl or wear our spider hand puppet and sneak up from behind. We'll say "Mr. Muffet" and "he" when a boy is on the cushion during the rhyme. Rhymes are really good for helping students learn phonemic awareness. We post with our lessons plans each week the new rhyme we say at Greeting Time. If you're following along with them at home, you could have your child clap out the rhythm or the syllables with you. It's fun to come up with different ways to do it, especially when your child is the one to choose (e.g. patting your head or alternating between patting your legs and clapping). 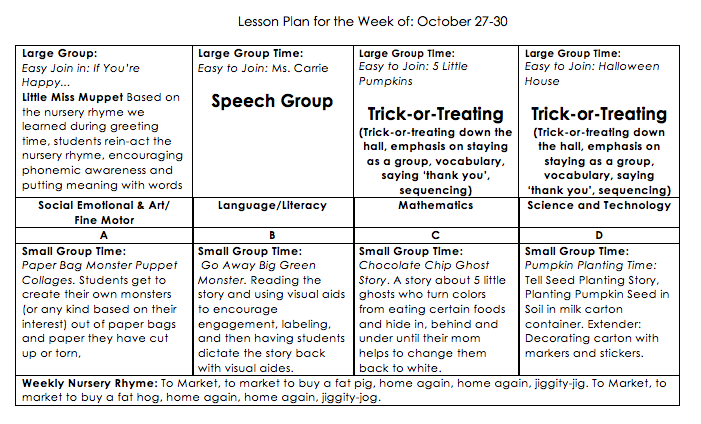 For our last two days of the week, we will be going Trick-or-treating during Large Group as part of our 'Costume Party' around to five different locations in the school (some classrooms, the kitchen, office etc.). Feel free to send them in costumes (for details, see my emails). We'll focus on "Please", "Thank you" to support our speech therapist's Large Group on polite words, sequencing and following directions.